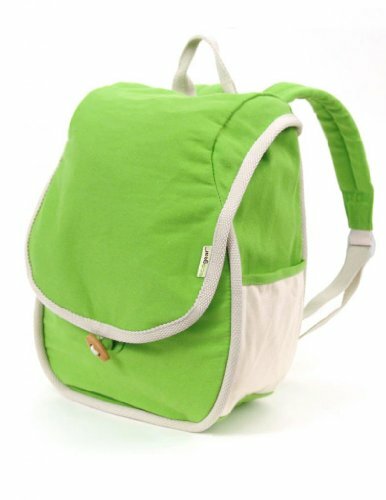 The Panda Backpack by EcoGear is a fashion-forward and planet-friendly bag that can double as an everyday school bag and traveling companion! A bag for kids of all ages, the Panda Backpack is ideal for school, overnight, and every-day use. <br /><br /> This PVC-free bag is made from natural cotton materials with buttons and buckles made from sustainable wood components. All colored materials used in the construction of this bag are treated with toxic-free dyes. <br /><br /> The interior contains one large, durable area for storage that securely fastens shut with a hook-and-loop closure. There are two smaller, exterior side pockets that are perfectly for water bottles, such as Klean Kanteen's BPA-free water bottles. There is a top web loop for hanging and two padded shoulder straps that are adjustable for the wearer's convenience.